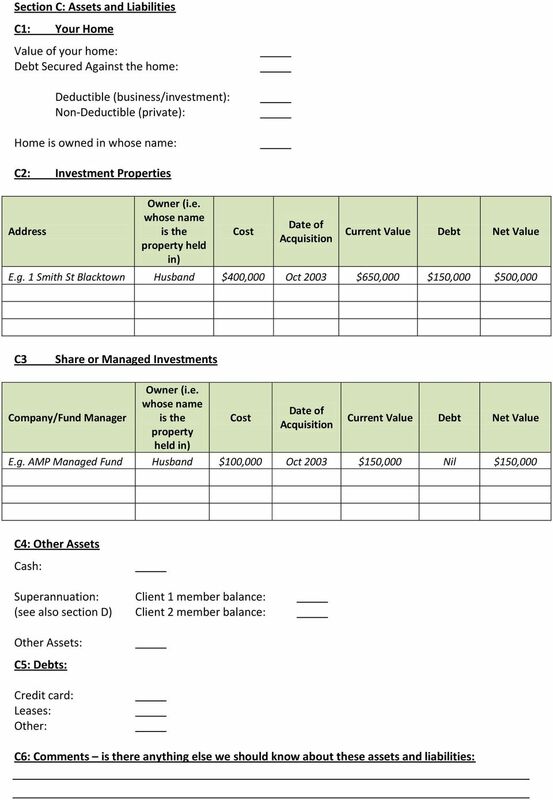 5 Section D: Superannuation Please complete the following tables: D1: Client 1 Name: Fund Annual Contribution Current Value Comments E.g. 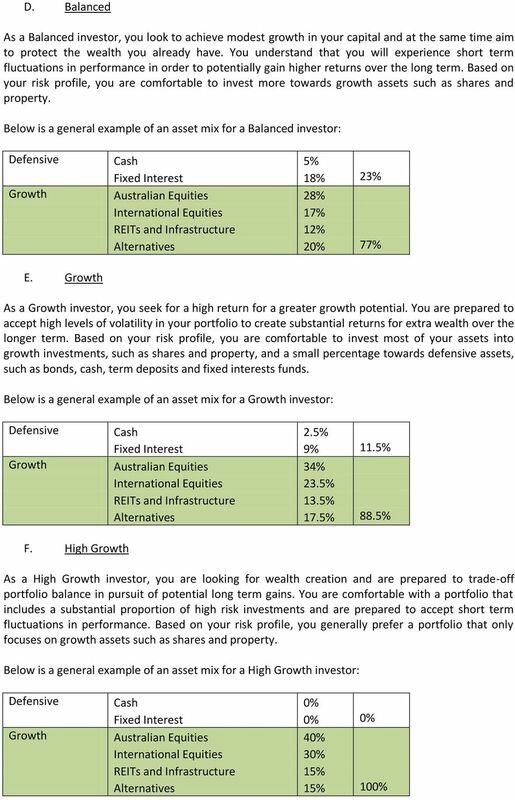 HESTA 9% of salary: $4,500 $52,000 Invested in high growth Are you happy with your current superannuation fund/s? 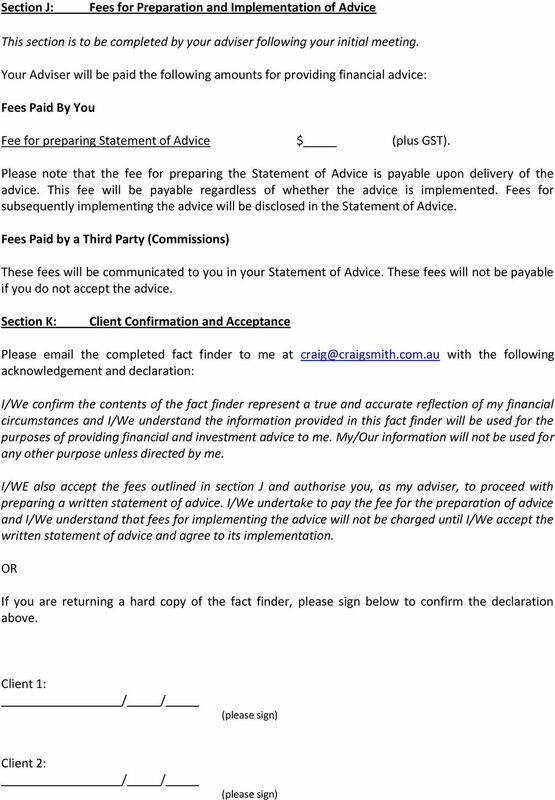 D2: Client 2 Name: Fund Annual Contribution Current Value Comments E.g. 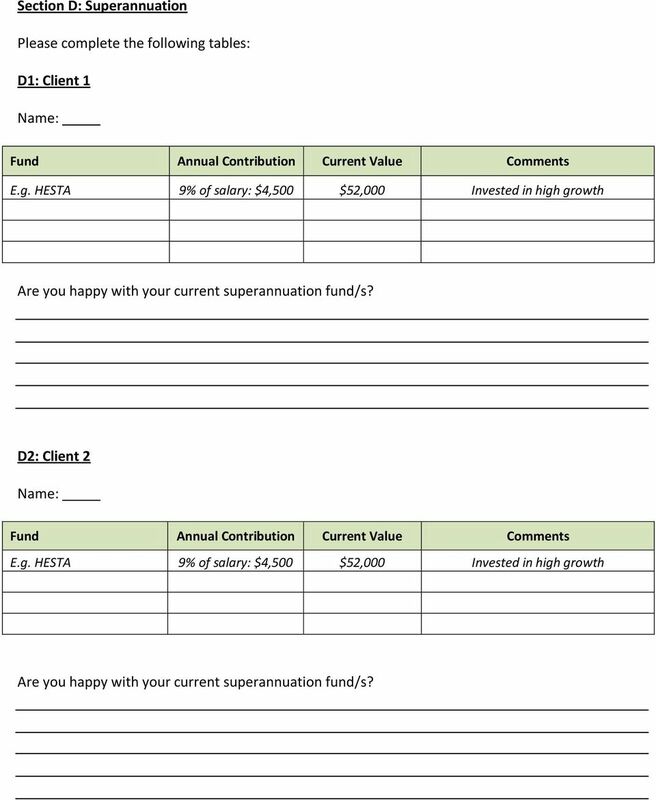 HESTA 9% of salary: $4,500 $52,000 Invested in high growth Are you happy with your current superannuation fund/s? 8 G1. 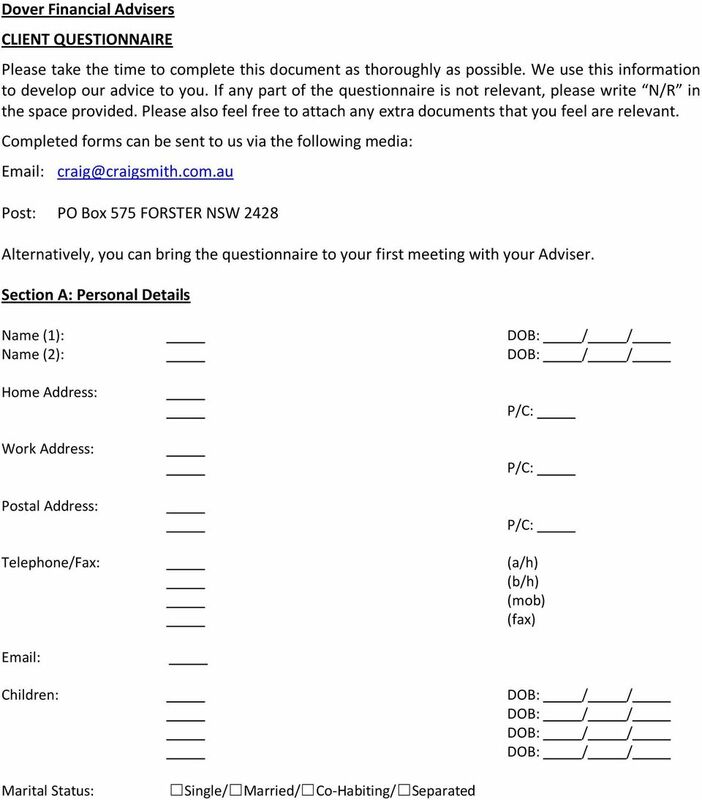 Please provide details of your current income. 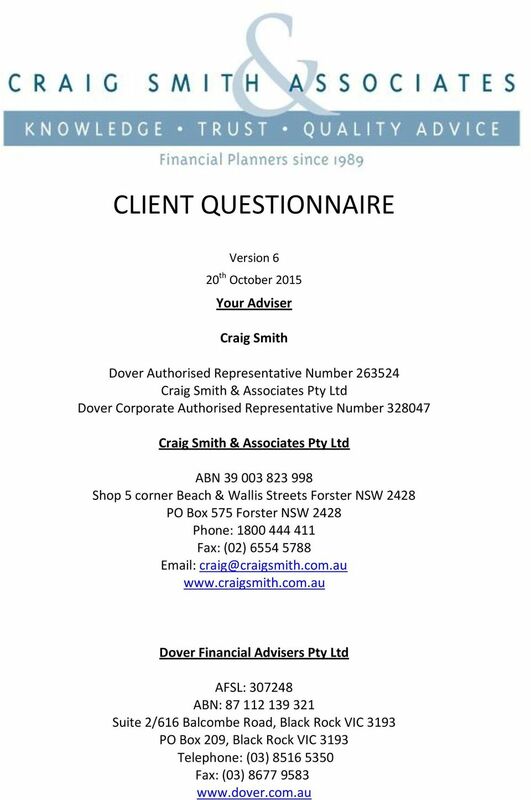 Client 1 Client 2 Name: Occupation: Employer: Name: Occupation: Employer: SOURCE GROSS $ PA SOURCE GROSS $ PA Salary Salary Business Business Trust Income Trust Income Centrelink Centrelink Superannuation Superannuation Rental Rental Dividends Dividends Other (please specify) Other (please specify) TOTAL TOTAL G2. 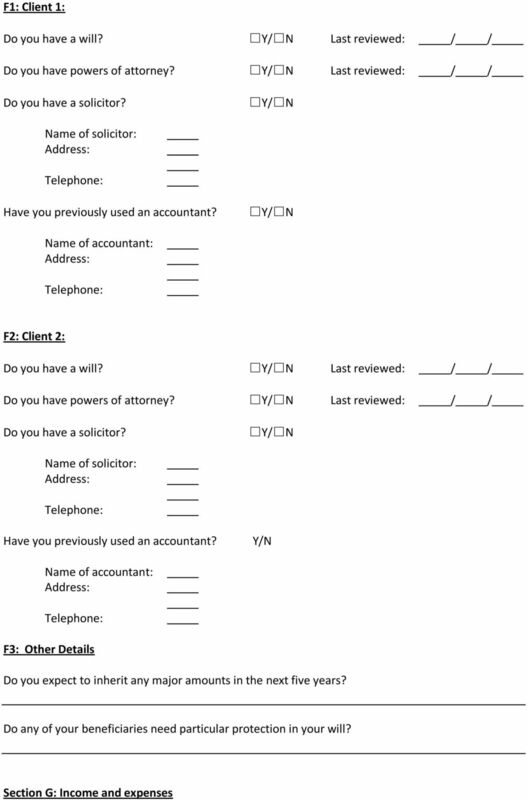 Do you expect to inherit any major amounts in the next five years? G3. 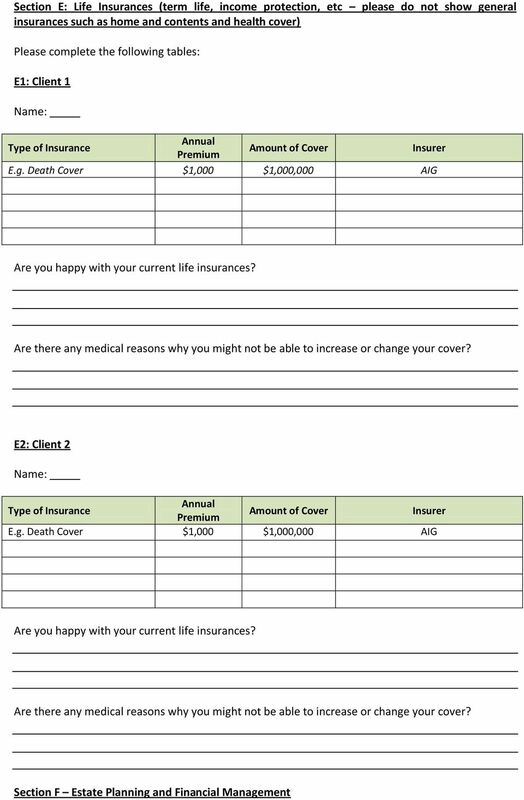 Is there any other further information about your income that may be relevant to the development of your financial plan? G4. 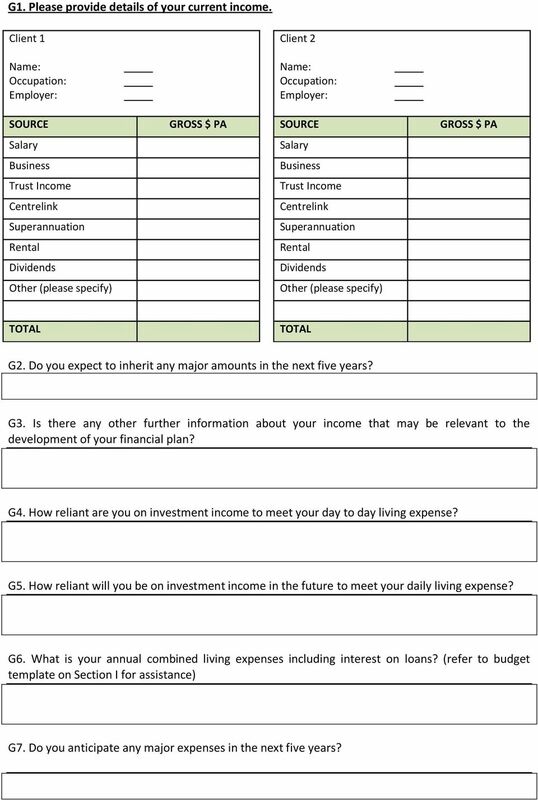 How reliant are you on investment income to meet your day to day living expense? G5. How reliant will you be on investment income in the future to meet your daily living expense? G6. 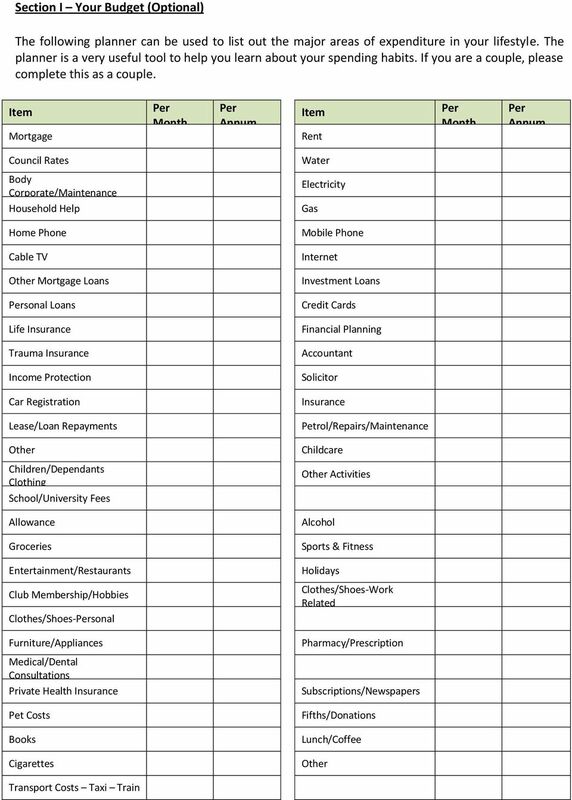 What is your annual combined living expenses including interest on loans? (refer to budget template on Section I for assistance) G7. 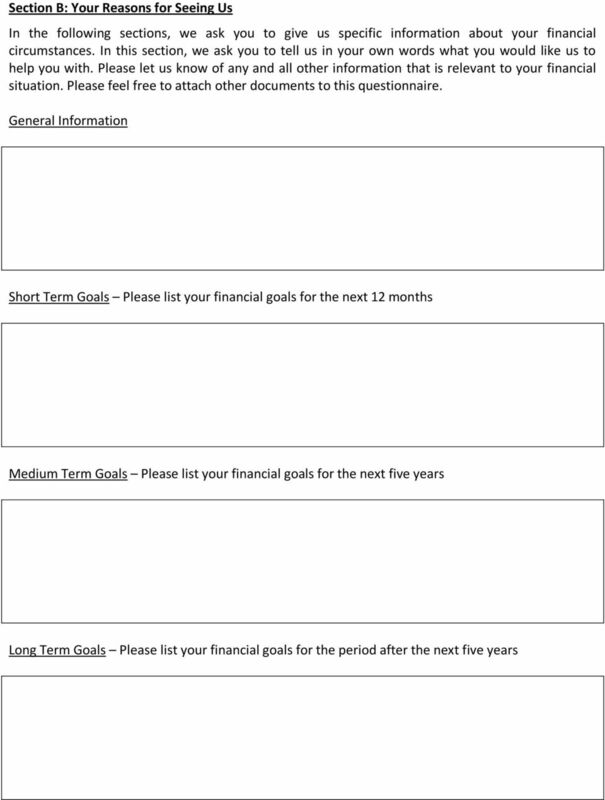 Do you anticipate any major expenses in the next five years? 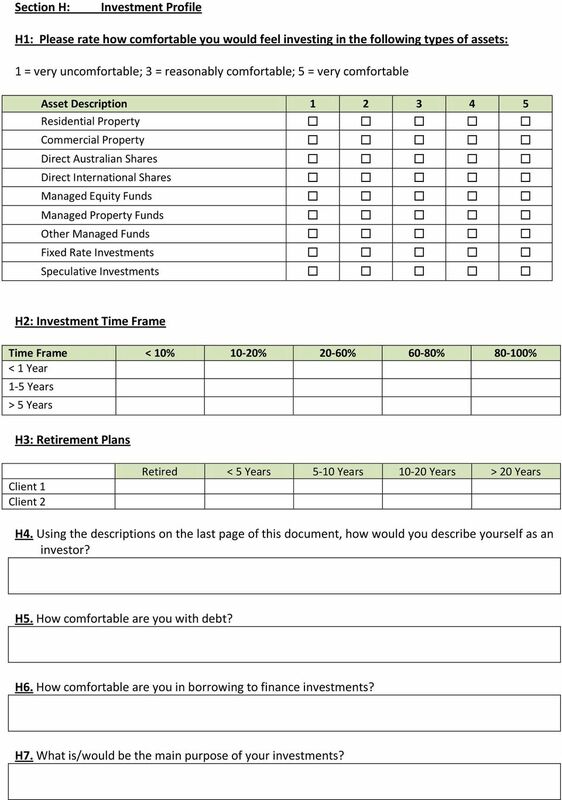 9 Section H: Investment Profile H1: Please rate how comfortable you would feel investing in the following types of assets: 1 = very uncomfortable; 3 = reasonably comfortable; 5 = very comfortable Asset Description Residential Property Commercial Property Direct Australian Shares Direct International Shares Managed Equity Funds Managed Property Funds Other Managed Funds Fixed Rate Investments Speculative Investments H2: Investment Time Frame Time Frame < 10% 10-20% 20-60% 60-80% % < 1 Year 1-5 Years > 5 Years H3: Retirement Plans Client 1 Client 2 Retired < 5 Years 5-10 Years Years > 20 Years H4. 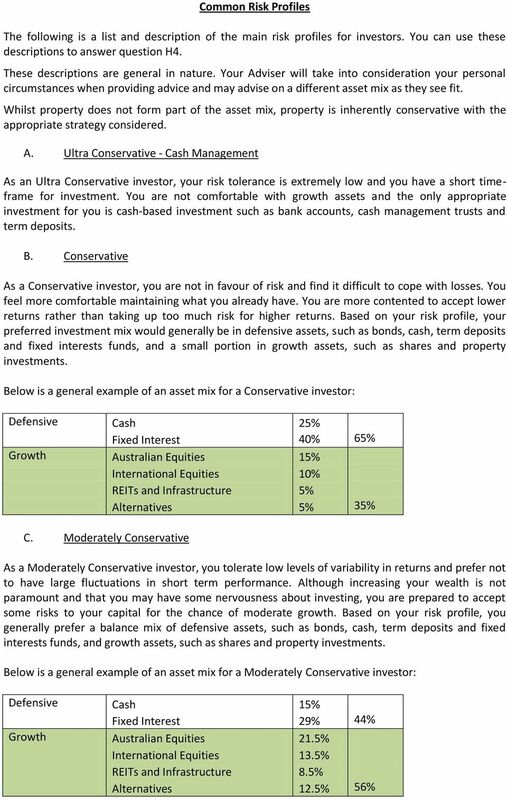 Using the descriptions on the last page of this document, how would you describe yourself as an investor? H5. How comfortable are you with debt? H6. How comfortable are you in borrowing to finance investments? H7. What is/would be the main purpose of your investments? THE MORTGAGE REDUCTION STRATEGY WHAT THE BANKS DON'T WANT YOU TO KNOW! Fact Sheet. What is the value of our advice?